This one happened very suddenly... A guy I work with came into my office one day and says he saw a pinball machine for sale at the Salvation Army, and that it had just been brought in; they were still setting it up. 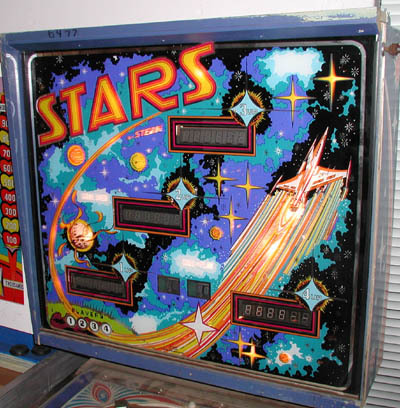 Well, it was just lunchtime, so I got my keys and drove the 10 minutes to the Salvation Army store, and found this Stern Stars machine from 1978. I gave it a quick look-over... 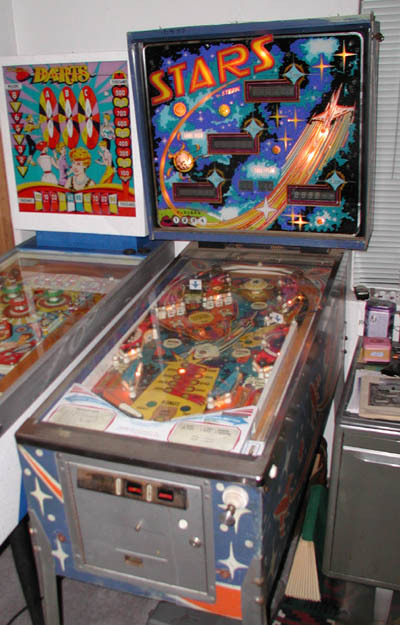 The machine was extremely dusty, but the playfield has just some minor wear. 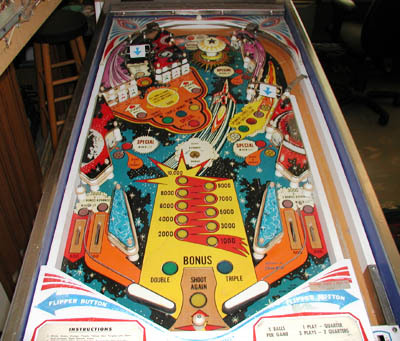 With these type of deals, the playfield condition is the key. On the downside, the backbox had suffered some apparent water damage, the backglass paint is flaking, and three of the displays were apparently not working. The coin door shows some rust, as well as the legs. 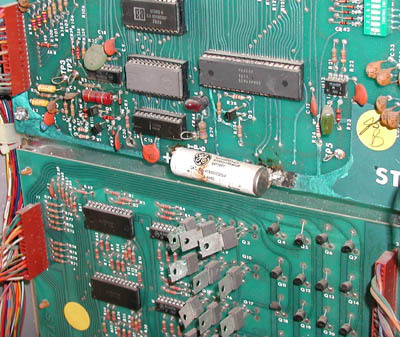 But the machine powered up and went into attract mode and I could get it to actually start a game, so it appears that the electronics are somewhat sound. So, I bought the machine for only $125, within an hour of it being brought into the store..
Once again, a big thanks to my brother-in-law Dave, who helped me get it home.. So this is my first purchase of the year, coming on September 17, 2002. Stars backglass on the left. The flaking isn't too obvious here, but I'll probably be looking for a replacement [Note: I have found a much better replacement]. As you can see, none of the displays are working in this picture. But with a little fiddling with connectors, three of the five came to life. I suspect they'll all be ok (they were). 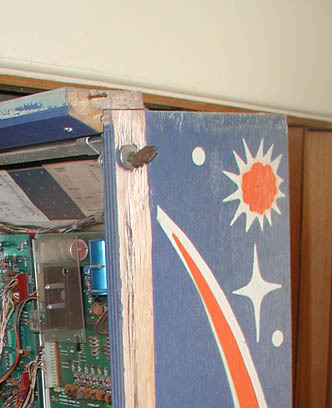 On the right is a close-up of the backbox. Due to some warping of the wood, I couldn't get the backglass off, and I could see that the right side had been re-attatched at some point. So, I was able to carefully remove the right piece of wood and slide the glass out. The top piece needs to be replaced, too (warped). cleaning will be for dust, more than grime. Very little wear here! On the left, the bad news... Battery corrosion! I don't think the damage is too extensive, though. 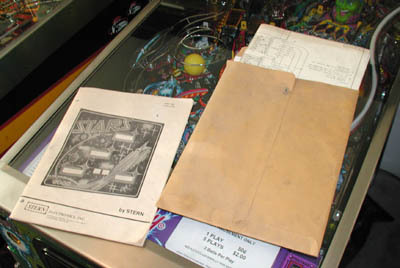 On the right the good news... All of the manuals, schematics and extra scorecards! Nice surprise! I don't know why I was ever concerned about getting a fifth machine... Fits like a glove!